Hey yall! 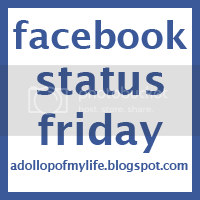 Welcome to the first ever Facebook Status Friday, where you get to see some of my fave status' from this past week, and hopefully other's will join in as well and we can see theirs! This is a really easy hop. Basically, just copy and paste your favorite status' from this past Saturday-Thursday, grab the Facebook Status Friday blog button, publish your blog post and link up here! So without further ado, I give you MY fave status'. In hopes of having a successful run at reverse psychology, I asked Brayden if HE could hold ME. He looked at me funny, then said "OK". So we sat on the floor and I sat in his lap. After 5 seconds he said "Mommy, off!" hahaha. Oh well. It was a good try on my part! wow J. Lo. The hair. It's... indescribable. So what are you waiting for? Join in!